Are you watching the Golden Globes right now? I am and I am loving the fashion! These stars are totally rockin it - I mean, wow! There are a few dresses that I have fallen for and I was inspired to turn these gorgeous gowns into small space design style. January Jones - wowza! She definitely can wear this number but I was inspired by the deep red color - love it! Red tones, or warm colors, create intimacy and close in a space so consider this color if you have a long or oblonged shape room. 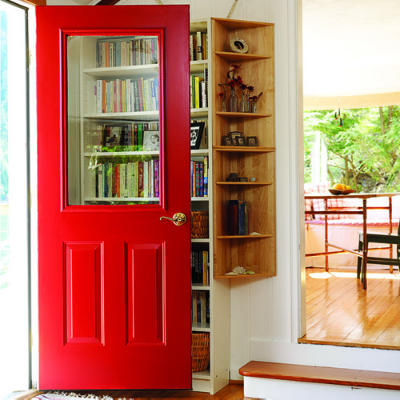 And add pops of color to your small space in unconventional ways - like painting your front door inside and out. I am loving Angelina Jolie's dress - sparkles and green? Yes!! I am so into green tones, pulled straight from nature, exuding sustainable style and just overall fabulousness. 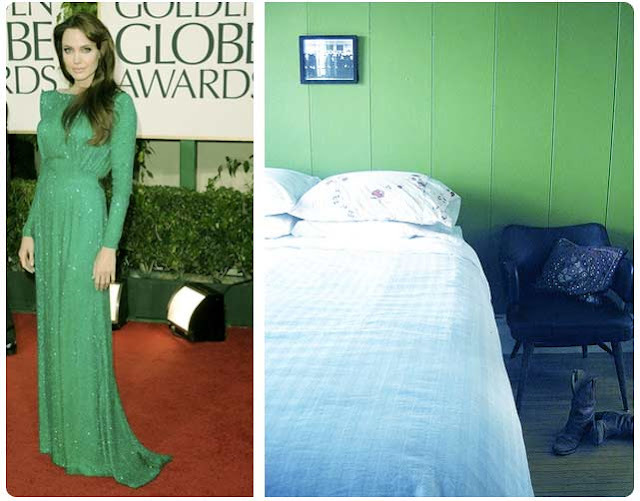 I love adding green to walls, it really provides comfortable yet timeless style. I really love JLo's dress - gorgeous! Pulling off white is tricky and she works it! The silver sequin overlay is stunning - the whole number works. I was inspired to pull a white room with accents because small spaces can benefit from adding texture and style. Just keep in mind lines. In this interior's case - the frames and pictures are clean, square style. I recently started watching The Good Wife and love it. I always look forward to see the lovely Juliana Margulies and her style. This pink and black color block gown is unique and inspired me to showcase dark decor as a statement piece in a small space. 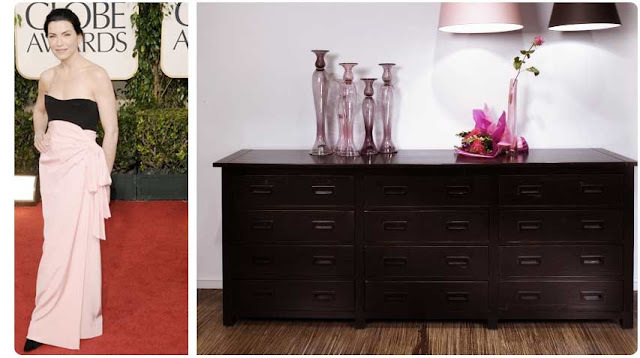 Just try to find a piece with legs - like the one pictured above. Floating furniture allows the eye to continue on beyond the decor and makes a small space seem big - yes! 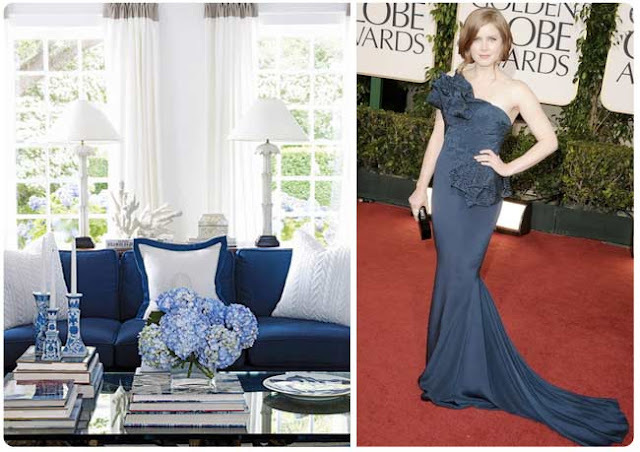 Navy blue - oh la la! I really love Amy Adam's dress - doesn't she look so fab?! Blue tones, or cool tones, are perfect for small spaces since they add a feeling of a space receding or opening up. I am loving this blue sofa and pretty accents against a white space. The pop of colors works and the blue anchors the small space. I saw Blue Valentine the other week - it's amazing! (and Ryan Gossling is super hot!) Very intense and shot beautifully. I actually liked Michelle's dress tonight - sweet yet cool - a neat style. I pulled these equally cool and pretty garden vases for the urban dweller. The combination of textures - rope, ceramic and natural foliage - are such a great addition to small spaces. Love this! What fashion are you loving on the Golden Globes? 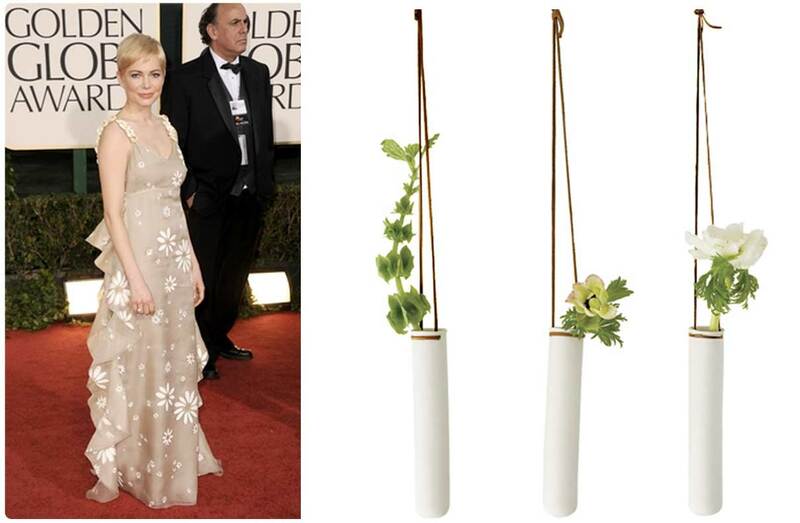 5 Responses to "golden globe fashion turns into small space inspiration"
So, so good to find you. I am just taking it all in!! The gowns are soo inspiring! Lovely picks! 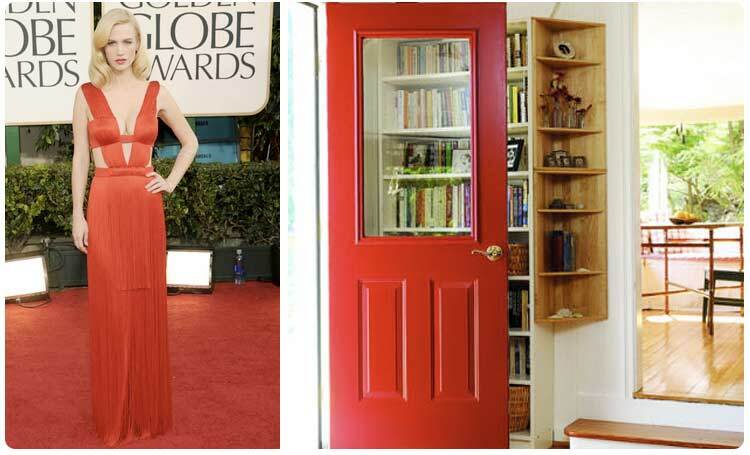 Anne Hathaway looked phenomenal tonight! i love how you paired these ladies up with interiors, nice work! what a creative post, i love it! i also saw 'blue valentine' and i agree, ryan gosling is such a hunk!